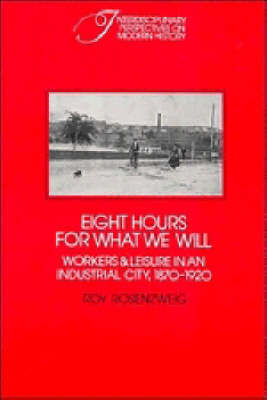 In the first comprehensive study of American working-class recreation, Professor Rosenzweig takes us to the saloons, the ethnic and church picnics, the parks and playgrounds, the amusement parks, and the movie houses where industrial workers spent their leisure hours. Focusing on the city of Worcester, Massachusetts, he describes the profound changes that popular leisure underwent. Explaining what these pastimes and amusements tell us about the nature of working-class culture and class relations in this era, he demonstrates that in order fully to understand the working class experience it is necessary to explore the realm of leisure. For what workers did in the corner saloon, the neighbourhood park, the fraternal lodge hall, the amusement park, and the nickelodeon had a good deal of bearing on what happened inside the factories, the union halls, and the voting booths of America's industrial communities.